Magic: Puzzle Quest v1.7 Is Here - D3 Go! From now on, members of the same Coalition will be able to chat with each other! Join a Coalition and click “CHAT” on the side-bar menu! Fight alongside your friends in the brand new Coalition Challenge event. Be sure to join a Coalition – these events are only open to players in a Coalition. The top players and Coalitions will win Mythic cards, boosters, and more! Our first Coalition Challenge has you face creatures from the plane of Innistrad. The more victories you earn and the more secondary objectives you complete, the more damage you deal to the event’s Boss; the corrupt angel, Avacyn. Players and Coalitions are ranked by the total damage dealt during the time of the event. Reach the top brackets before the event ends and earn the best rewards. Only members of a Coalition can join this event. Card text has been rewritten for many Shadows Over Innistrad cards, making them more consistent. The wording now uses more clearly-defined rules, and should be easier to read and understand by players of all skill levels. To ease players into the game and make understanding keywords a lot easier, we are introducing tappable keywords on card text. Shadows Over Innistrad cards now feature tappable keywords. The keywords are highlighted Bold and underlined. When tapping on them, you can see a quick description of the referenced ability. For example, if you do not know what Madness does, you can tap on the Madness keyword on any card and a small pop-up appears, explaining the ability. The new release will have a brand new selection of special offers – including Planeswalkers, Mythics, and special bundles. Check in every week for new limited-time offers! We rebalanced Kiora, Master of the Depths and Sorin, Grim Nemesis. Her first ability, Crashing Waves, now costs 9 Loyalty (up from 6). Sorin’s first and second abilities have been completely redesigned. His loadout has also been improved. Vampiric Drain now costs 6 (down from 9). This ability costs 15 Loyalty. Sorin’s loadout also changed. He can now use 8 Creatures, 3 Spells and 3 Supports at level 1, and 10 Creatures, 5 Spells and 5 Supports at level 60. • Prized Amalgam: Resolved another major issue causing crashing. It should now be fully working and no longer cause lockups. • Runaway Carriage: No longer has Prevent Damage. • Slayer’s Plate is now a Support card. • Seasons Past: Multiple changes. – The card now costs 20 (up from 15). – The gem conversion now happens before cards are returned to your hand. – Seasons Past can no longer return a copy of itself to your hand. • Harness the Storm: Multiple changes. – The card now costs 12 (up from 6). – The gem destruction now happens before the spell is returned to your hand. • Ulvenwald Hydra: Multiple changes. – Cost increased to 14 (up from 10). – Chitinous Cloak: Now costs 5 (down from 7). • Sage of Ancient Lore: Now costs 16 (up from 10). • Werewolf of Ancient Hunger: No longer draws 2 cards when it transforms. • Westvale Abbey no longer has Prevent Damage and now costs 15 (up from 10). • Ormendahl, Profane Prince: No longer has Prevent Damage. • Tyrant of Valakut had a bug where it would gain mana when tokens would enter the battlefield. This has been fixed. – Card text no longer references a support when viewing the Hope Against Hope’s card description. – Fixed issue related to when Anguished Unmaking is cast while the opponent’s first creature has Hexproof. – Avacyn’s Judgment should now always deal damage correctly. – The opponent no longer targets their own creature when the opponent casts Inner Struggle. – Fixed multiple issues that occurred when Silverstrike and Gideon’s Reproach activate during the same turn. – Creature no longer dies without creating a 1/1 Spirit token when Destroying a Human creature buffed by Slayer’s Plate. – Fixed issue when a Creature transforms into a Werewolf while Howlpack Resurgence is on the gemboard. – Opponent no longer buffs a player’s creature when the opponent casts Haunted Cloak. – Card no longer fails to be drawn when directly damaging an opponent with Jhessian Thief during Battle. – Fixed triggering issue with Olivia, Mobilized for War’s ability and Madness. – Board no longer freezes when replacing a Zombie token with the incoming Prized Amalgam. – Planeswalkers: Ability affects creatures in hand correctly when Herald of Kozilek casts the Announce Kozilek ability. – Fixed glow animations on cards when opening packs. – Fixed graphics for Coalition Logos in the Search tab. – White boxes no longer display when viewing text fields. – Placeholder text no longer displays when viewing story for Sorin, Grim Nemesis. – Placeholder text no longer displays when viewing Saheeli Rai’s Planeswalker abilities tab. – Placeholder text no longer displays when viewing Coalition Score in Rewards Earned. – Red Xs no longer display when viewing multiple cards & widgets in some languages. – Fixed multiple issues when viewing the Invocation of Saint Traft card description. – Fixed text error when viewing Subjugator Angel. – Fixed multiple issues that occurred when viewing Koth of the Hammer’s Abilities. – “No match found” error message no longer erroneously displays when looking for a match. – “Internet connection issue” text no longer appears instead of the maintenance prompt when the server connection is disabled. – Event Ended Rewards now remain on the screen when the Event ends while a player is in an encounter. – Players not entering a Quick Battle for a long time will no longer end up in empty lobbies. – Find Coalition button now consistently brings players to search. – Fixed multiple issues that occurred when interacting with Event Rank buttons. – The correct leaderboard is now always displayed when switching between multiple boards. – Fixed multiple issues that occurred when interacting with Nodes Screen. 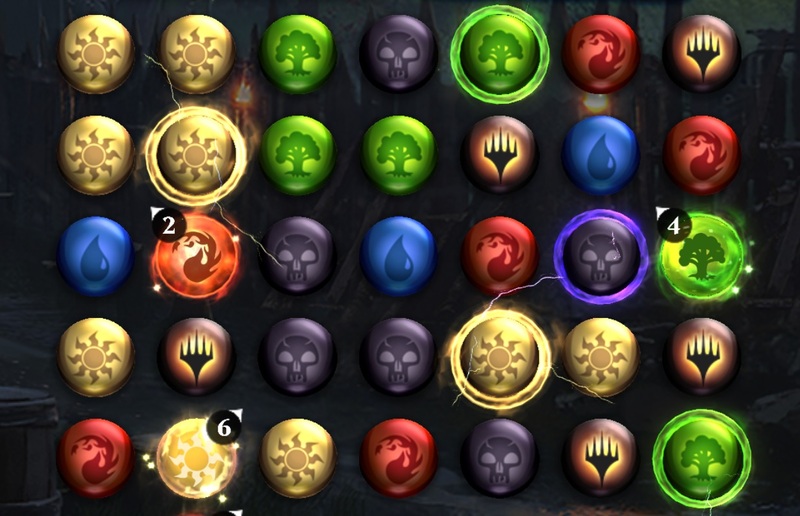 – Fixed multiple Planeswalkers display issues when viewing player portraits. – Fixed progress bar display when viewing the second objective for Saheeli Rai’s Challenge Event. – Fixed multiple grammatical issues in Tutorial. – Fixed text display when viewing the Card Transform prompt. – Startled Awake & Westvale Abbey are no longer missing from free packs and SOI packs. – Fixed occasional purchasing issues on iOS. – Players no longer sometimes move down in rank when another player matches their score. – Coalitions no longer sometimes allow 21 members. *Many additional bug fixes have also been made and are not listed in the notes.